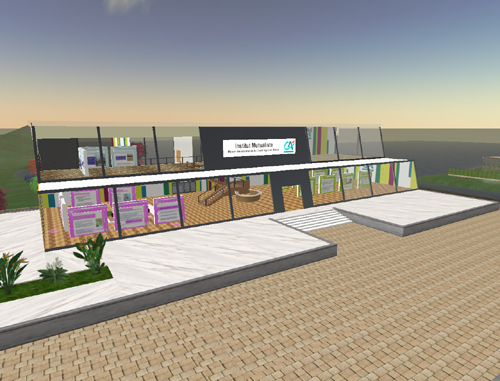 There's another bank in Second Life, after BNP Paribas the second French Bank in SL is Credit Agricole. I've never heard from them other than that they're sponsoring one of the Tour de France teams, but that's about it. 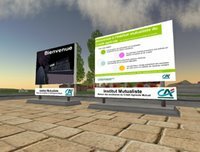 "Crédit Agricole SA (CASA) (Euronext: ACA) is the largest banking group in France, second largest in Europe and the sixth largest in the world by Tier 1 capital according to The Banker magazine. It is also part of the CAC 40 stock market index. Calyon, the investment banking division of Crédit Agricole. LSA, the Asian securities brokerage division. LCL (Previously Crédit Lyonnais), the nationwide retail banking network, acquired in 2003. Okay, enough of the promo. We understand they're pretty big in Real Life. But I'm not sure they're big in SL yet. Their focus, like ING, is not on banking in this virtual world, or establishing a presence but on collaboration, mutualism as one of their hosts, Caliel Writer told me. The Institute for Mutualism (have to watch typos here or it'll get mutilated) also exists in the Real World, though this isn't a replica. Other parts of the sim are the boat, which is a part of history, space to set up future franchises and a piece of nature "where we can relax and which we should save and cherish" according to Caliel. I'm by far too exited on getting out some new info on Rezzable, so I'll keep this short. I have to, since I logged out of SL so fast I forgot to save my transcript of the conversation with the kind Caliel. 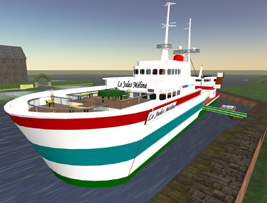 For more info, read Ambling in Second Life's Credit to Crédit Agricole. One last remark though that should be mentioned. Right now everything is in French, but they're working on getting out the info in English as well. be careful, it isn't Credit agricole SA (CASA) but the Federation of Credit Agricole. Thanks for the info, I'd appreciate that. As for mix-ups, I'm sorry, the info wasn't available in English.